HOW WOULD MEDIEVAL PILGRIMS RETURNING FROM SANTIAGO DE COMPOSTELA TO WATERFORD HARBOUR HAVE TRAVELLED HOME TO DUBLIN? Every year for the past fifteen years I have walked one of the many medieval pilgrim roads in France and Spain that lead to Santiago de Compostela in the far north-western corner of Spain. I usually travelled by Irish Ferries to France and then by train or bus to continue on the Chemin de St Jacques de Compostelle in France or the Camino in Spain. But last year, following an invitation from the Gaultier Historical Society to include in my talk a local connection to the pilgrimage, I walked from my own front door in Faithlegg, Co. Waterford, to take the much shorter and cheaper (€2) ferry from Passage East to Ballyhack in County Wexford. To my great delight, not long after starting up the hill from Ballyhack I realised that I was walking on an Irish ‘Way of St James’, on what I now believe is the medieval route that Irish pilgrims would have taken when travelling from St James’s Gate in Dublin to Waterford or returning to Dublin and the eastern half of the country. This article offers the reasons why I came to that realisation and all the information you need to make the same journey, whether on foot or by armchair. The first recorded pilgrimage to Santiago took place in 951 and was led by Godescalc, bishop of Le Puy, a town in the Auvergne region of France. Among the millions of pilgrims who descended on Santiago over the next few hundred years were Irish pilgrims who were identified by the scallop shells and bone relics recovered with their remains in archaeological excavations in Tuam (1986) and Mullingar (1996). The pilgrimage experienced a significant lull because of the Black Death in the 1340s and the Hundred Years’ War between England and France, which ended in 1453. There then immediately followed a long-pent-up resurgence of pilgrims making their way to Santiago, a hundred years more of pilgrimage, which ended with the dissolution of the monasteries and the wars of religion. Before I began to look at the Irish dimension I had assumed that only wealthy people, such as James Rice, mayor of Waterford and wine merchant, could afford to make the journey by sea, as he did twice, in 1473 and 1483. But also in 1473 the Mary London, a ship carrying 400 Irish pilgrims returning from Santiago to Waterford, was captured by pirates; the pilgrims were later released (minus their belongings, one would assume) at Youghal. In May 1456 an English pilgrim, William Wey, counted 84 ships, many of them from Ireland, moored in La Coruña, the port an easy week’s walk from Santiago. The authority on this issue, Roger Stalley, estimated that perhaps 5,000 pilgrims arrived within the space of a few days and that in this peak period two million pilgrims were on the move. This would mean that a remarkable number of Irish pilgrims were returning to the ports of Dublin, Drogheda, Galway, Dingle, New Ross and Waterford. I set myself the task of answering my own question: how would pilgrims who had travelled from St James’s Gate in Dublin return there from Waterford? I was assuming that the majority of pilgrims were without the funds to purchase direct passage to La Coruña and would walk overland from Dublin to Waterford or New Ross and then travel by sea to France to continue overland across the Pyrenees to Santiago. The motivation for the pilgrimage for many was to save their souls from eternal damnation, and the devout pilgrims understood that the journey should be a penance and an ordeal (not that a sea voyage across the Bay of Biscay in those days was a picnic). They would also know, by word of mouth, that abbeys would provide a chain of accommodation, food and medical care from the coast of France to Santiago, free of charge, for genuine pilgrims. My plan that day was to walk from the quay at Ballyhack north towards New Ross as the crow flies, or as the pilgrim walks, the easiest and most direct route, and to see what I encountered on the way. I had done some earlier research, looking for a church to start from, a pilgrim essential. On the current Ordnance Survey map a graveyard is indicated nearby, and Francis Jobson’s 1591 map (p. ??) shows that a church of St James once stood on that site. This was a very exciting discovery, as there are churches dedicated to St James at Dingle, Drogheda and Dublin (at St James’s Gate), all known departure points for pilgrims. The church looks down on to Arthur’s Bay, but I understand that its earlier name was St James’s Bay. The returning pilgrim would surely give thanks at the church before continuing up a broad track leading to a large open field where a fair was held every Michaelmas and also on St James’s Day, 25 July. Although it is now a dead end, it is worth imagining the scene at the time of the fair, which specialised in black bullocks and hogs, and, as a pilgrim, to see ahead of you the Blackstairs Mountains leading on to Mount Leinster, while behind you Creadon Head looms out into Waterford estuary. But if you are following my footsteps, return to the churchyard, walk through it towards the main gate and turn right after climbing the stile at the gate. This is the old road that was replaced by the modern road below you, taking traffic to and from the ferry. On your left you will come to a very old ruined farmhouse, which I mistook at first for the church because it is exactly oriented towards the east. Lying on the ground before this building is a millstone. On this site medieval monks from nearby Nook and Great Island cut millstones from the outcropping red sandstone. I wondered whether the monks would have offered accommodation to pilgrims waiting for ships in return for some manual labour. The views up and down the river are commanding from here. Above: Dunbrody Abbey, Co. Wexford, where pilgrims would have been able to claim hospitality. Above: St Mullins, Co. Carlow—among the many ruins you will find a small chapel dedicated to St James. Continue to the end of this road and turn right onto the main road up from Ballyhack. Soon you will be facing a green lane and you may well imagine that you are now walking a Way of St James. Turn left when it rejoins the main road. Turn left again when you reach Grange and on your right you will pass a holy well. 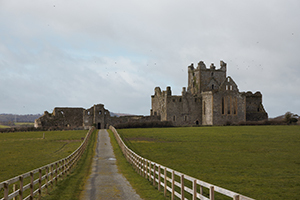 Your next stop will be Dunbrody Abbey, where pilgrims would have been able to claim hospitality. Continue to head north and the straight road ahead leads to the Kennedy homestead and eventually to New Ross. But turn right instead and you are in Horeswood, passing another church of St James. Keeping straight on, you pass through Burntschool crossroads, and at a bend to the right on the road to Whitechurch are the ruins of a very old building, with three standing stones in the field just beyond. The road continues through Ballykelly, where there is another church, and then the very medieval hamlet of Oldcourt, where there is a church behind a barn. Such a number of churches and ancient remains suggests that this road is a holy way. It is now a long slog beside the main road into New Ross, and I chose to drive the next very long section from New Ross to St Mullins. The River Barrow is practically a gorge between these points and there is no river path. 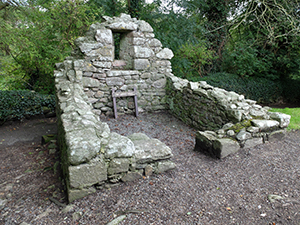 At St Mullins, among the many ruins you will find a small chapel dedicated to St James—a very popular pattern day is held here every year on 25 July, the feast-day of St James. Below the medieval ruins the river now has a broad tow-path on the right bank facing north, called ‘the trackline’ by Barrow people but in my opinion it is in fact the Slighe Chualann, identified by Colm Ó Loughlainn as one of the five ancient roads, the Road of Cuala, ‘a district comprising south County Dublin and part of County Wicklow’. Going north or home as a pilgrim, you will continue alongside the Barrow through Graiguenamanagh to Leighlinbridge, where you will turn right away from the river and head north-east on the Slighe Chualann though the possible pilgrim stops of Tullow, Rathvilly, Baltinglass, Dunlavin, Ballymore Eustace, Kilteel, Rathcoole, Saggart and Tallaght. You will now be within easy reach of the original starting point at the church of St James in Dublin, where pilgrims would certainly have offered prayers of gratitude to St James for a safe journey home and one made possible by the roads and facilities on offer all along the way since arriving at St James’s Bay in Waterford estuary. Damien McLellan is a consultant psychotherapist and also teaches at Carlow College. N. Byrne, The Irish Crusade (Dublin, 2008). B. Colfer, The Hook Peninsula (Cork, 2004). P.C. Power, History of Waterford City and County (Cork, 1990). 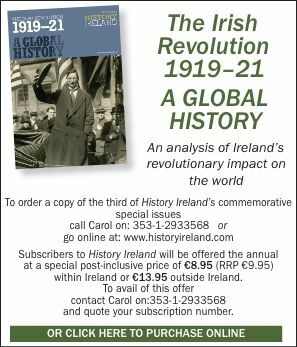 The author would like to acknowledge the assistance of colleague and historian Dr Margaret Murphy in providing crucial research material. 1968 In what became known as the ‘rivers of blood’ speech, Enoch Powell MP strongly criticised mass immigration, especially Commonwealth immigration to the UK, and the then proposed Race Relations Act. 1954 Michael Manning (25), a carter from Groody, Limerick city, was hanged in Mountjoy Jail for the murder of an elderly nurse. He was the last person to be judicially executed in the Republic of Ireland. The last judicial execution in Northern Ireland took place seven years later, in December 1961, when Robert McGladdery (26) from Newry was hanged for the murder of a local woman. 1912 Abraham ‘Bram’ Stoker (65), author, notably of Dracula (1897), died.